The main thing I'm always asked by other Playmobil fans is how do I build my houses, either how do I design it or how do I put it together. 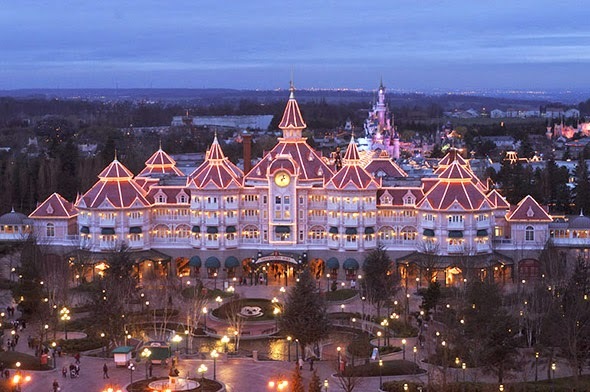 So here's a post about my latest and biggest design a Disney Hotel. Back in February I was asked if it was possible to build Disney's Hotel and theme park entrance and was given several photos. I was asked if I could build it with just 2 of the pink floors and not to make it too long if possible. When I first look at a real building to see if it can be copied I look at the type of wall used and the number of windows. This building obviously would have to be made from System X parts as it would give me the square windows and archways needed. I could then work out the size by copying the number of windows across. Normally I draw things out on a bit of paper then mock up a basic design but I had 2 problems with this. One it might be a bit hard for my client to understand my plans ( I can't draw very well) and two I didn't have enough parts or the right type in my own collection to build this. If I'm making a totally new design for some one I like to show them some sort of mock up of the building so they can see what it might look like and I can get a sense of the parts, time and costs involved before we agree to go ahead with a commission. Luckily I'm a member of Playmofriends forum where I had heard of Sir Pleamo's and his friends work on a 3D design system for Playmobil. So I thought it was time I gave it a go. Sir Pleamo's 3D design system. Now I can't give enough credit to this guys hard work in undertaking such a massive and well done project. 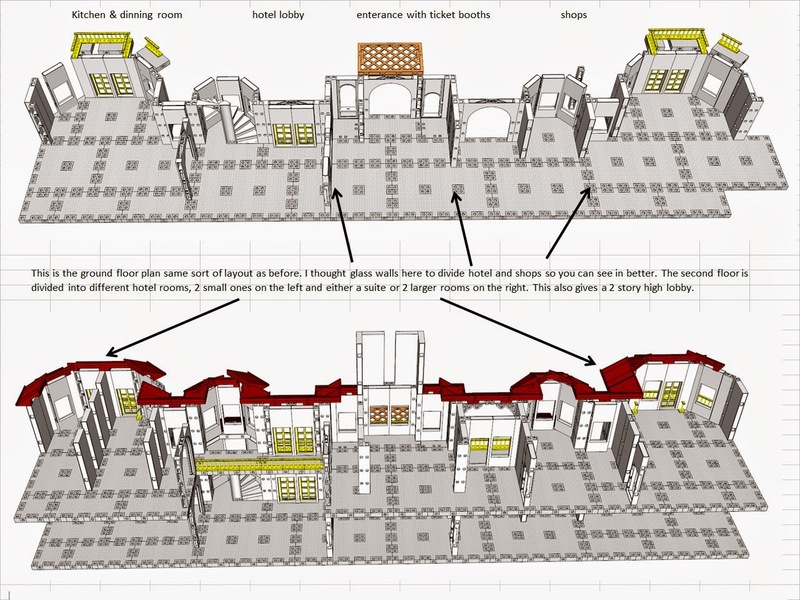 Basically Sir Pleamo and friends are trying to create every piece of Playmobil built, as a virtual 3D object that can be used to create anything you can think of using Google's Sketch Up program. So far there are over 1700 parts already done. I'm quite good with computers and I design all my own wallpaper on it but I've had no experience with 3D cad design before and can't believe how well they've done everything. It is truly amazing the work involved. I am in total awe of it all and I just wanted everyone who admires my Disney Hotel to know that the original idea was made possible using this system. So this was my first version of the hotel, not as stunning as the Sketch Up designs I've seen before but it was my first attempt and it was enough for me to see what would work and what wouldn't. This is a window by window copy of the left half of the building with the centre column / entrance on the far right. I only worked on one side as the other would be a mirror image. I always start a copy of a real building like this as it's easier to cut down the size than have to enlarge a design. As you can see although this would be very true to the original hotel it would be a huge building and with the other side added on far to big. From this design above I had to cut a few things down, I ditched the square ends and the larger tower, what was the small tower would became the larger of the 2 towers and I designed an even smaller tower to add in it's place. So this was my 3D design which let me work out the sort of parts I would need and let my client have a good idea of might be possible to build. I say might because until you have the actual parts in your hand you don't know what will work and what wont but it gave me a very good starting point. From these plans I was able to ransack my palace, modern house, church and school to get enough parts together to see if it would work. I had already shortened the building again because I was to keep it to around 2m long. As you can see although it is close to my original idea I felt it was just missing something, the towers didn't have the same impact. The best option was to raise the centre up another floor to make it look more impressive. This was going to be my final design I just had to start collecting all the parts so I could start building it. Until I realised how many of the older modern houses I need to get enough windows, this would be costly as I needed 46 windows and I think there was only something like 6 in the house plus there would be loads of parts I couldn't use. Time to change things again. My next version involved palace windows, easier to get hold of and they give a nice surround on the wall. As you can see from the last few photos as well as working on the walls I had a go at the roof. Because the roof is the worst part of this design, if I couldn't get a roof that looked right I might as well not bother doing the building at all. Let me just say the roof was as hard as I expected it to be and this took a fair amount of trail and error building and dismantling things to try and get it right. Even though it's finished and I don't think it looks too bad I admit if I had more time and money I would have liked to try a second row of roof parts to try and create more of a pointed tower top. The only things left to do on the outside were the balconies and the central clock tower. I tried a variety of balconies and in the end finished up with "fake" ones rather than ones that could be walked on. The clock tower I decided to leave till much later. Now that the walls were built the next thing was the internal layout. Whenever I design a building I need to know what rooms must be in it and what rooms would be nice to have if possible. From there it's a question of working out a sensible layout to get everything in the right place with access from the front door and into each room. The most important room of any building is the hallway, depending on where it goes will alter which rooms can come straight off it and which ones need to be accessed through a corridor room. You wouldn't want to walk through a bathroom to get to a bed room for instance. I know it's not always possible to be logical with Playmobil room layouts but I do try my best to make it sensible. We had already agreed on the sort of rooms needed, a main entrance to the park with ticket sellers, kitchen dining room, reception, bedrooms and maybe a store. This was one of my earlier floor plans. Now that the walls were built it was actually easier to get a sense of the room sizes and what could fit in them. Having seen it built I was asked to change the layout a little, making 3 large bed rooms, a meet and great room, and a display room on the second and third floors. I could now build the internal walls and put the doorways in the right place. The building sorted out it was time to return to my favourite (NOT) part of Disney - the dreaded roof! Just look at it! It has pointed tower tops, small dormer sections around the edge and an overhang! If my towers had been proper full circle towers I might have been able to lean the roof parts in towards each other to create a point. But my towers are more a "U" shape and too wide to stretch the Playmobil roof sections across. As I said earlier with enough time, money and parts I might have tried a second level of roofing to actually close the tower tops but it just couldn't be done at the time. I started off thinking I might use the school roof back when I had square windows, but this was no good as it wasn't tall enough to give the impression of proper tower tops. So the longest piece Playmobil do in plain roofing was the steck red roof parts. Of course steck and system x don't clip together, nothing is that easy! I had to make the roof as a separate part that could hold its self up on it's own without collapsing inward and help make the hotel more portable. I can't tell you how much time and effort went into doing that roof, cutting bits out hoping it would work. Pulling it to bits trying different designs. I think that first section of roof I rebuilt about 6 times just trying to get everything lined up. The original building has an overhang around the roof edge which I wanted to recreate, this would have the added benefit of being a stable base to fix the steck roof to as well as matching the original design. This gave me a small lip in front of the roof slope where I could add the fake dormer sections. But because this was narrow I had to cut all the original dormer roof parts up to fit. Then I had to fill in the gaps and try to make the cut edges look a bit neater. I think out of a 5 month build I must of spent at least a month maybe a month and a half working on just the roof! The 3 different window tops I thought of. I like to take photos of the different builds so I can compare them side by side and pick out the best, especially if I'm working with a limited number of parts. Here's the alternate bedroom doorways I tried. Most of my builds are like this, there are very few that don't get tweaked along the way. Here you can see the new bedroom doorways and the final version of the balconies, the exterior isn't finished yet to this I've got to add awnings over the windows. This ended up being almost the last thing I did as I had to make 24 awnings for the front and I needed a rest from cutting up Playmobil roof sections before starting on them. To give myself a little break from building I started doing the furniture in the middle of all of this. For the furniture I was asked to do the bedrooms in a Victorian style with a large master suite at the top of the building, with the rest decorated how I'd like. Because the hotel had to be cut down in size the restaurant and the reception room had to be on one side of the building with the gift shop on the other. This meant a combined kitchen and dining room for the layout to be more realistic. Remember there's a park entrance in the middle so they have to be together on one side. This led to a modern open plan kitchen you find in a lot of new restaurants now. Once I'd made a start on most of the furniture it was back to the building to do the flooring and wallpaper. You wouldn't believe the time I spent trying to find the right pattern for the wallpaper. I wanted something with a white background that would fit with the white window sections yet look elegant but not too bold as I didn't want to overpower the rooms with too striking a design. I tried stripes, mottled, damask and none really fit until I came across a floral print with birds on it. I was still too bright so I had to tone it down and then I changed the colour. Pink for the main hotel rooms and blue, gold and red for the three bedrooms to match the furniture. I wanted to use the same pattern throughout the whole building to give it a modern unified look but still be able to change the colour as needed. System X is great to build with very flexible and I don't need to cut parts up which is always a major pain when doing Victorian houses based on the 5300. The down side to System X is the connector holes EVERYWHERE! Great for building not so good to look at. This means having to cover up more of the walls etc than I would normally. The floors are marbleised to cover the base holes and I've had to put an edger around all the floors. This is a copy of the pink one used in Playmobil's latest palace. Next is to furnish it and put all the small decorations in, one of the best bits of any project. 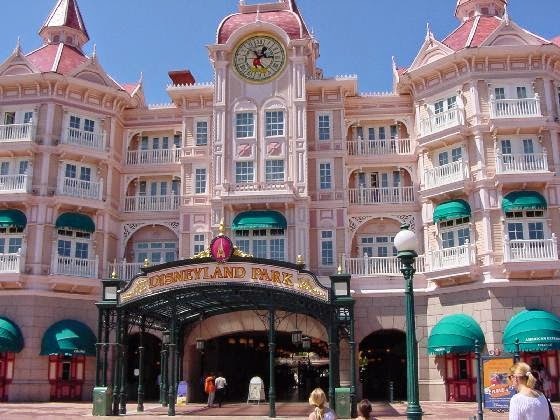 The Disney Hotel is also the main entrance to a theme park and will be used on a much larger display that will go on tour. As this needs to be a portable building I've also had to construct it in such a way that it can be easily dismantled. As I've mentioned the roof is in 4 separate sections and you can see from the picture above I've built the hotel into 3 sections, the central entrance and 2 sides. These can be in turn broken down into 3 base plates and 7 large wall sections so the whole hotel can be flat packed. It's just a case of connecting a side wall to a front wall and add to the base. All the individual parts have been glued together to make it a faster rebuild. The only thing that has caused some problems with this is the addition of awnings to the front which are mostly attached to the balconies rather than the walls. It was these things I had to consider while creating the basic layout and the arrangement of the parts. 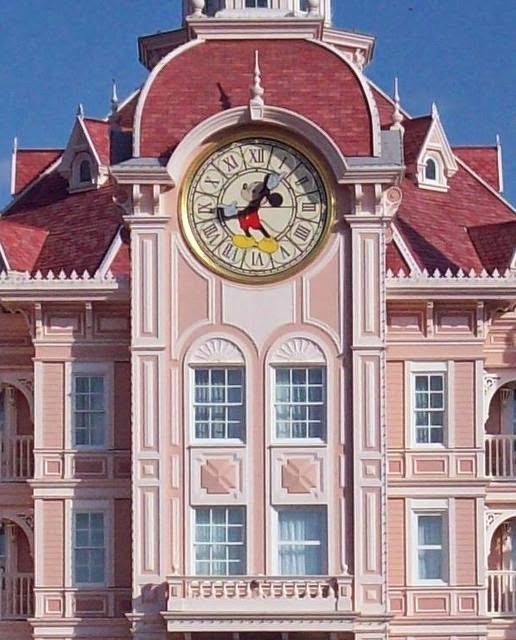 The largest feature of the Disney hotel is the central clock tower, as much as I'd like to do a copy of this I just couldn't do the complicated roofing. instead I had to go with the general idea of the tower. It's got a great curved top and my first idea was to use the modern house doorway. A bit too tall, I was going to cut it down then I thought of the old palace roof front which has a nice shape. The clock face has Mickey in the middle and his arms are the clocks arms, it would be brilliant if I could do this. Some research later and I found a wind up alarm clock with moving Micky arms, different clock face but it would do. I now needed to build a tower to house the alarm clock inside. Burnt fingers later (I had to heat the roof sections) I have a box ready to fit the clock. I just had to dismantle the clock, paint the surround, make a front plate, fit it all inside, put a back on it to hide the clock, then decorate it. See even doing a simple thing like a clock tower has a lot of time and effort involved in it. If you've kept up with this post so far then you'll realise it's almost finished. By this stage I have a painted and decorated building with roof and clock tower. The furniture is done and set up and I'm down to the last few things. The exterior just needs the awnings adding to it with a couple of signs for ticket prices inside and out and the exterior is done. Inside it needed some Disney wall art, I've used stickers for a lot of these plus some printed pictures and statues. I was asked to do all the statues in gold as my client didn't want the decorations to look too cartoonish. I also built some small display stands like the Beast's Rose below that could be moved around the hotel. The hotel is finished at last, barring any last minute changes my client would like, there have been some while I wrote this but I don't mind as I always work closely with my clients so they are happy with the final build. It's done, finished, completed, phew!!!! So whats gone into it? Could you spot all the different buildings I've used parts from? Fancy trying it yourself, as I said at the start of this post everyone keeps asking how I do it. I'll start you off with a shopping list. Add to these the common parts of system x floors, double width posts, walls and some edging and you got an idea of what I've used to build it. Where did I get the parts from? Well some I got by buying the buildings listed but most of the more unique parts I had to order directly from Playmobil Direct Service because of the large numbers involved. Thank you Ladies for your help with my orders! and about 400 hrs or so over 5 months to build it all! I enjoy building and designing new Playmobil projects but it is time consuming it's also very addictive :) All I can say to new builders is have lots of patience and don't worry if things go wrong you always learn from your mistakes. Want to see the finished building? You'll just have to wait a while until I can get the last few photos taken!